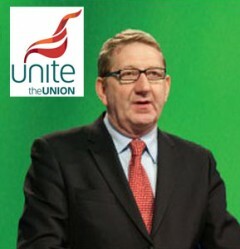 Opening Unite’s policy conference in Liverpool today, Len McCluskey’s planned speech ranged across issues from the severity of Tory attacks on working people and their families (as well as on Unite itself) to the importance of electing a Labour government and the menace posed by UKIP. But for Labour and union activists keen to use Labour’s policy process to ensure Labour presents a bold and radical programme to defeat austerity and provide new hope, there will be some disappointment. Such activists warn that ‘austerity lite’ has not been enough for PASOK in Greece and the French socialists to avoid decimation in their recent polls. But Len McCluskey warns that now is not the time to have heated arguments within the Labour Party about policy. The message he chose to highlight was that working people, their unions and our NHS are facing the “fight of our lives” to see off a Tory government in 2015, which would otherwise set about destroying the remaining rights and freedoms, ensuring a voice against austerity and a defence against exploitation. He urged the conference to see the Labour party as the best hope of draining the “swamp of ill treatment” and reversing the rapacious privatisation of the health service spawned by the coalition – but warned that these will intensify dangerously should the Tories win the general election next May. And he vowed that Unite will not send Labour into battle against the party of the rich with “one hand tied behind its back“, promising that the union will not sit on the side lines in the most important general election for generations. We meet on the Liverpool Docks and when I was young, men used to gather every morning in large halls scattered along the docks, hoping for a day’s work. Bosses used to walk amongst them tapping them on the shoulder and giving them a Brass Tally which guaranteed a day’s work. And when the bosses tired of that they would take the remainder of the tallies and toss them into the air and watch men fight for them. And I mean fight, because it meant putting food into their kids’ bellies. Zero hours from another age – back now to haunt us. Is there any hope amidst this swamp of ill-treatment? The most important challenge Unite will face over the next eleven months is winning next year’s general election. There is a time to have heated arguments within the Labour Party about policy. There is even a time to discuss the future of the Party itself. But that time is not now. We have a clear and vital choice before us. It’s whether we can evict the present ruinous Conservative coalition from office and get a Labour Prime Minister into Downing Street. There is no third option. So let there be no doubt. Unite stands fully behind Labour and Ed Miliband in the increasingly radical agenda he has outlined. It is a people’s agenda and this union will be proud to fight alongside Labour to secure it. Is there more to do? You bet there is. Ed has to understand that only by offering hope to our kids; only by being on the side of the ordinary men and women of our nations, only by rejecting the siren voices of austerity lite will he win the trust of the electorate. Have conviction, Ed. Ignore the personal stuff, it is trivial nonsense. Our members are not interested in how you eat a bacon butty, only that you bring home the bacon for working people. And we will not let Labour fight for this programme with one hand tied behind its back. We will be up against the Party of the rich, bought and paid for by the rich, with its coffers overflowing with cash from hedge funds, the City and those doing very nicely out of health privatisation. Unite will do its bit to make sure that the next election is not financially lop-sided because democracy demands a fair fight. We must challenge UKIP which uses anti-immigrant rhetoric to mask the fact that it is anti-union, pro-big business, anti-NHS and more Thatcherite than Thatcher herself. UKIP are dangerous and not because I believe they will make any significant inroads into the corridors of power, but because they make racism and prejudice seem respectable. If others are afraid to enter the battlefield with UKIP, we are not. Unite stands ready to take them on for what they are – a right-wing menace to our communities and our society. This is a back-handed compliment in a way – the Tories, their media allies and the rest of the establishment would not bother with us if we were not fighting for our members and our values in an effective way. They are afraid of us. We challenge their privileged position in society and they don’t like it one little bit. But these attacks form part of a dangerous agenda. The Tories want to be able to reassure global big business that trade unionism is being kept in its box, that the sacred flexible labour market is not going to be challenged, that Britain is open for exploitation. If the Tories win we will face a government determined to put many of the normal functions of free trade unions outside the law. But we will be ready. And we will not be cowed. The Conservative Party should not assume that we will put respect for unjust laws ahead of our duty to fight exploitation and ruthless employers. We will fight for our members within the law where possible. But let the Tories be in no doubt that if they push us outside of the law, they will be responsible for the consequences, not us. It’s no exaggeration to say that the future of our society, and the future of the labour movement, will be in the balance over the next twelve months. Let there be no doubt – we’re now facing the fight of our lives. Now I’m tempted to focus today on the one closest to my heart. But I guess you don’t want to hear half-an-hour about Liverpool FC and how unlucky we were not to win the Premiership last season. But seriously colleagues, it’s an honour for me to, once again, report to this conference on what Unite has done and what it’s planning to do. You are the supreme authority in our union and the greatest working-class gathering in Britain and Ireland. Normally, this is the point where the General Secretary starts setting out HIS ideas about what’s going on (and I will do some of that a bit later). But first, I thought I would, for a change, let Unite members speak for themselves about working life in Britain and Ireland today. Our Communications department regularly surveys our members as to their views and concerns. We email them on a range of topics and get direct feedback. They put the problems working people are facing more vividly than I could. “My boss demands that I work 60 hours a week and I’m then left without work till it suits them. I cannot buy anything, I cannot plan anything”. “I questioned health and safety policy and was given no work for three weeks and told not to mention it again”. “We feel insecure, vulnerable, bullied, exploited, weak”. “Some weeks I will get as little as 24-hours, other weeks 60. I can’t really plan anything on the days off as I don’t know when I’ll be working again and I’m waiting for a phone call all the time”. “It is totally impossible to plan for anything. You are bonded into a weird sort of modern slavery that nobody sees, living under this yoke of fear”. There are, literally, hundreds of such stories. “Imagine a picture of a face; now imagine it without a mouth. That’s it – I can‘t say a thing or it’s goodbye. It’s like removing the word ‘plan’ from the dictionary. What a picture of Tory Britain, of the working lives of so many. This is the reality of the much-trumpeted “flexible labour market”. We meet on the Liverpool Docks and when I was young, men used to gather every morning in large halls scattered along the docks, hoping for a day’s work. Bosses used to walk amongst them tapping them on the shoulder and giving them a Brass Tally which guaranteed a day’s work. And when the bosses tired of that they would take the remainder of the tallies and toss hem into the air and watch men fight for them. And I mean fight, coz it meant putting food into their kids’ bellies. Zero hours from another age – back now to haunt us. Is there any hope amidst this swamp of ill-treatment? Well, let me finally quote Clifford, a driver: “I’m lucky that I work for a good company – and I belong to a strong union”. The only hope for millions of our citizens. So what does Unite say to these members? And what do we say to those who have not yet found their way to trade union protection? We say – Unite is here for YOU. Your problems, the daily struggles you face, the injustices done to you at work, are the reason we exist – the reason we came together to create this 21st century trade union for working people. This powerful force for good in our society. Unite is the first and strongest line of defence for people at work. Our 50,000 volunteer workplace reps, the heart and soul of Unite – are here to help you. Our 400 professional officers are paid to secure the best deal for you, collectively or individually. But most of all, Unite is here to help you to help yourself – to organise at work if you have no union. To give you the framework to strengthen your hand if you already have recognition. without a voice an opportunity to join our family and be empowered. Campaign alongside us in the People Assemblies and the other movements for justice. But whatever you do, don’t just put up with it. We can’t always guarantee victory, but we can guarantee our best efforts to secure justice for each and every Unite member, as we work in the midst of the greatest economic storms of our lifetimes. Sisters and Brothers, The history of the last hundred years teaches us that working people need political action alongside strong trade unionism. That’s as true today as ever. Some of the abuses I have mentioned demand a change in the law. We will debate politics and the Labour Party later on this week. But, obviously, I need to mention the most important challenge Unite will face over the next eleven months – and that’s winning next year’s General Election. Conference, There is a time to have heated arguments within the Labour Party about policy. There is even a time to discuss the future of the Party itself. We have a clear and vital choice before us. It’s whether we can evict the present ruinous Conservative coalition from office and get a Labour Prime Minister into Downing Street. I’m as keen as anyone, as you’ve probably noticed, on debating Labour policy. But I want to have those debates with Ed Miliband in Number 10, not in opposition having to resist a Tory regime out to destroy everything we hold dear. Of course, there are frustrations with Labour, my god there are. We get that message from our members loud and clear. But they are as nothing compared to the devastation that a majority Tory government could wreak. So let there be no doubt. Stop the break-up of the NHS. Build 200,000 homes a year. Increase the top rate of tax and tackle tax avoidance. These are not trivial commitments. Taken together, they could be transformative. They are a people’s agenda and this union will be proud to fight alongside Labour to secure them. Is there more to do? You bet there is. Ed has to understand that only by offering hope to our kids; only by being on the side of the ordinary men and women of our nations, only by rejecting the siren voices of austerity lite will he win the trust of the electorate. Ignore the personal stuff, it’s trivial nonsense. Our members are not interested how you eat a bacon butty, only that you bring homebthe bacon for working people. It’s also important, Conference, that we don’t let Labour fight for this programme with one hand tied behind its back. We will be up against the Party of the rich, bought and paid for by the rich, with its coffers overflowing with cash from hedge funds, the City and those doing very nicely thank you, out of health privatisation. So Unite will do its bit to make sure that the next election is not financially lop-sided. Democracy demands a fair fight. You see Conference, money is just about the only thing the Tories have going for them at the moment. In the battle of ideas, the tide is turning. The Pope has said it, even the Governor of the Bank of England has said it – capitalism is failing. And when a French academic economist can top the best-seller charts in the USA and the UK with a 600-page book about inequality, you know something is going on. That man is Thomas Piketty and he has thrown down a challenge to governments the world over – he has proved that capitalism leads not just to inequality, which we didn’t need to be told, but that it inevitably leads to an ever-widening gap between rich and poor. An unequal country is a sick country. And by that measure, Britain and Ireland are very sick indeed. It is said Labour needs a big, over-arching idea to knit its different policy proposals together. Surely it’s this – make Britain a society which offers all its citizens a secure life with expanding opportunities in stable communities, a country run by the people and for its people, not the bond markets and hedge funds; A society pulling together not tearing itself apart. That’s real social security – not just a question of welfare benefits, but of everyone knowing they will not be denied the chance to live a fulfilling life. A society of citizens and workers, not just consumers. We used to hear a lot from Labour about aspiration. Surely this is our aspiration in the 21st century – A more equal and just society. Let me now say a word about what may be the most difficult and sensitive political issue of our time – immigration. There is no doubt that the unscrupulous exploitation of this question lies behind much of the deeply unwelcome rise of UKIP. And there can also be little doubt that the Tories will play on these fears to advance their own reactionary agenda. If the issue is being discussed by our people in their workplaces and communities we must engage. Let me set out how I think Unite should address this issue. Perhaps it’s a good moment to do so. One of our own, Mohammed Taj – a Muslim immigrant to this country many years ago from Kashmir, a bus driver from Bradford and a long-standing member of our Executive Council – is President of the Trades Union Congress, the first Muslim to hold this position, and I know that this conference will want to pay tribute to Taj for this memorable achievement. Unite stands for the equality and the unity of all workers, in Britain and Ireland, and around the world. Our approach to the question of immigration is, and always will be, a class approach. “A study of the struggle waged by the British working class reveals that, in order to oppose their workers, the employers either bring in workers from abroad or else transfer manufacture to countries where there is a cheap labour force. Given this state of affairs, if the working class wishes to continue its struggle with some chance of success, the national organisations must become international”. Clearly, what Marx was describing 150 years ago, is what the ruling elite has been doing in this country over the last generation. Anyone who has had to negotiate for workers, in manufacturing in particular, knows the huge difficulties that have been caused by the ability of capital to move production around the world – often to China and the Far East or Eastern Europe – in search of far lower labour costs and higher profits. Likewise, the elite’s use of immigration to this country is not motivated by a love of diversity or a devotion to multi-culturalism. It is instead all part of the flexible labour market model, ensuring a plentiful supply of cheap labour here for those jobs that can’t be exported elsewhere. The pressure on those workers at the low-skill end of the labour market in particular, has been intense. Likewise, the strain on social facilities is severe under a government indifferent to people’s well-being and intent on cutting these services. First, we need to do everything necessary to organise all workers here into Unite, wherever they may have been born and whatever their history. And to fight for decent pay, proper working conditions and full rights at work. We will continue to devote substantial resources to this critical work. Second, let’s unite to demand that this country – the sixth richest in the world – provides every worker, wherever they are from, with a decent job and every family with a decent home. With those reasonable guarantees, I believe much of the concern whipped up about immigration would start to fade. And third, we must unite with trade unions in other countries, as we have pioneered in Workers Uniting, to ensure an end to the playing off of workers in one part of the world against each other. To oppose the power of global capital with the power of a renewed international labour movement, linking up especially with trade unions in the poorer parts of the EU. The problem is not cheap labour in Britain – it’s cheap labour anywhere. All this is easier to say than do, I accept that. But that’s the challenge to Unite and the labour movement as a whole – to beat racism by securing a better future for all. And to challenge UKIP which uses anti-immigrant rhetoric to mask the fact that it is anti-union, pro-big business, anti-NHS and more Thatcherite than Thatcher herself. UKIP are dangerous and not because I believe they will make any significant inroads into the corridors of power, but because they make racism and prejudice seem respectable and acceptable. If others are afraid to enter the battlefield with UKIP, we are not. Unite stands ready to take them on for what they are – a right-wing menace to our communities and our society. Sisters and Brothers, When we look back over the last two years, we can’t ignore the fact that Unite has been under the most sustained attack that any union has had to endure for a generation or more – indeed, since the great miners’ strike thirty years ago. Of course, this is a back-handed compliment in a way – the Tories, their media allies and the rest of the establishment would not bother with us if we were not fighting for our members and our values in an effective way. We challenge their privileged position in society and they don’t like it one little bit. Some of the hysteria and fury, signifying nothing, arose from the Falkirk parliamentary selection process. I don’t want to scratch that scab – Unite and the Labour party have moved on. I merely want to repeat to this conference what I have said consistently elsewhere – your union did nothing wrong in Falkirk. The Labour Party and Police Scotland themselves have said it – we broke no rules and we broke no laws. It is not a crime for ordinary working men and women to join the Labour Party and seek to promote their views, and I hope it never will be. The more serious attacks arose out of the dispute at the Grangemouth refinery. The details of that dispute are a matter of record, and need no repetition here. The most important thing for me is that at every stage in the dispute, Unite faithfully represented the views of its members, and, most importantly, at every point we retained the support of our members under the most testing circumstances. It’s easy for a leader to associate themselves with victories. But I was proud to go to Scotland and stand shoulder to shoulder with our members during difficult times and knowing they were about to make difficult decisions. When goaded by the media who asked was it a humiliation? My answer was simple – it is never a humiliation to represent the views of working people. Despite INEOS using every possible legal move – and then some – to break Unite at the Grangemouth plant, we are still there, still organised, ready and willing to fight for workers’ interests. Despite losing “check-off” facilities, our members – everyone – have remained with their union. So let me say loud and clear, so that Jim Ratcliffe can hear me on his yacht moored off the French Riviera :– Unite is here to stay, you’ll never get rid of us! And let me also say that I am proud of ALL our representatives at Grangemouth, and all our members who have tried to stand up to gross industrial bullying and I ask this conference to pay tribute to them today, and, in particular, Stevie Deans and Mark Lyon. You know, Conference, instead of the media asking, how it is possible for one multi-billionaire to own a national asset crucial to the economy to bully and hold to ransom the workforce, the Scottish government and the Westminster government, they and the forces of reaction chose instead to vilify Unite. Our activists smeared and trade unionism itself put in the dock. Of course, such attacks are water off a duck’s back as far as our activists and most of our members are concerned. I’m not sure it resonates much with the wider public either. BBC polling has found that the public are sceptical of big business, not of trade unions. Not surprising really, as it’s big business that wrecked the economy and has given Britain, Ireland and much of the world six wasted years of austerity and social misery. But these attacks form part of a dangerous agenda. The Tories have noticed that Unite has been winning industrial disputes and that workers are starting to organise in the midst of the economic chaos. Their agenda is to nip that in the bud by the only means they know how – recourse to the law and the courts. The vilification of Unite, which we can wear as a badge of honour, is designed to soften up public opinion for another round of anti-union laws. The Tories want to be able to reassure global big business that trade unionism is being kept in its box, that the sacred flexible labour market is not going to be challenged, that Britain is open for exploitation. The measures Cameron wants to introduce would not only further restrict our ability to fight and win disputes for our members. They would also jeopardise the right to peaceful protest for everyone in society. Now the Tories have sought out an obliging lawyer, his name: Bruce Carr, to give a legal thumbs-up to their plans. This is the man who convinced a pliable judge that a 90 per cent Yes vote in a 90 per cent turnout in a secret postal ballot was not enough to allow cabin crew at British Airways to take strike action. He has taken his orders from the Tories to provide cover for the further round of laws to shackle trade unionism which they will introduce if they win power next year and he will be well paid for it. The Carr review is about writing the most long-winded and expensive press release in political history and it’s right that the TUC and all affiliated trade unions have said we will have nothing to do with this stunt. Instead, our focus is on winning the argument within the Labour Party as to how a Labour government can tackle the scandal of anti-union legislation. And we are pressing forward with that. If the Tories win, of course, we will face different problems. A government determined to put many of the normal functions of free trade unions outside the law. But we will be ready. And we will not be cowed. I can only repeat today what I said two years ago. The Conservative Party should not assume that we will put respect for unjust laws ahead of our duty to fight exploitation and ruthless employers. We will fight for our members within the law where possible. But outside it if necessary, while taking all prudent steps to protect our union. Prudence, however, cannot mean paralysis, as it did for too long in the past in our movement. Our first obligation is to the members who pay their subs and look to us for support, not to a judiciary implementing class-war laws. And let the Tories be in no doubt that if they push us outside of the law, they will be responsible for the consequences, not us. Brothers and Sisters, Trade unions are not the only great national institution with their future on the line. The next general election will determine the future of the NHS. In flat contradiction to the pledges he made in 2010, David Cameron has embarked on the privatisation of the NHS, Handing over great chunks of our health service, one mouthful at a time, to his friends in the private sector. This is not just another example of a politician cynically going back on his word. It is a fundamental assault on our health care by private profit, and if it succeeds we will be paying the price for generations. Plenty of people have protested against this process, our members working in the health service prominent amongst them. That’s the obligation we owe to those who fought so long and so hard to establish the welfare state and to give millions of working people the confidence and security that they will get treatment when sick, whatever their circumstances. We’re not going to let this historic gain for ordinary people slip through our fingers because of apathy or fatalism or because a bunch of public schoolboys see a chance to earn a few bucks for their friends. You will see a presentation from Sharon Graham later in the week. So I urge every delegate here to play their part in supporting the NHS campaign being run by our Organising Department. Literally – our lives depend upon it. Unite is a members’ union. There is nothing more important to us than our lay democracy, ensuring that our members feel not just supported by the union, but involved in it wherever possible. While we can be proud of how our democratic structure has taken root after the formation of Unite, we cannot be complacent. Involvement in our internal elections is far too low – largely as a result of the archaic balloting procedures imposed on us by law, Procedures designed to separate our democracy from the workplace, where the union lives and breathes. The Executive Council constantly conducts health checks on the state of our network of constitutional committees, and we embarked upon an ambitious branch re-organisation plan, designed to root our union still more firmly in the workplace. That’s not been a painless process and, in places, it could have gone smoother and been handled much more sensitively, but I believe it’s giving us the best framework possible for strengthening Unite where it matters, at our workplaces. I also have an obligation to report to you on our management of Unite’s resources. Your Executive Council, and I as General Secretary, have not shrunk from taking tough and even painful decisions to ensure that Unite maintains its financial stability and protect front-line services to the membership. We will continue to do so in future, because members have a right to be assured that their subscriptions are being spent where it matters – on protecting and improving their terms and conditions at work above all. Our finances are in good shape, but be in no doubt, that this is only because of continuing exacting controls and management, designed to root out inherited inefficiencies and to exploit new opportunities. Our Legal and Affiliated Services department is achieving miracles in maintaining and improving our revenue, through the better management of legal relationships, the improved marketing of affiliated services, and through organised and aggressive work to retain members who would otherwise have lapsed. Our IT department has secured enormous savings over the last eighteen months in our technology infrastructure and systems. A professional audit of our education service has identified a million pounds in savings, without reducing our education courses to the membership. We’re looking at ALL areas of Unite’s work and all regions with a view to ensuring a similar level of efficiency and cost-effectiveness. Making Unite fit for purpose. Administering Unite is not just a technical matter. It has to be imbued with our values. To take one important example, we are taking a range of steps to increase the diversity of our officer corps. Some of this will take a little while to bear full fruit, but immediately we are acting to address the under-representation of black and ethnic minority colleagues in the higher levels of the union. Colleagues, Let me close this speech by summing up the Unite achievement of the last two years. It’s a record each and every member can take pride in. Our paying membership has stabilised and started to grow again, despite the recession. We have worked with employers wherever we can and, as a result, have helped to secure the future of thousands of jobs in energy, in the motor industry, and elsewhere. And let me remind David Cameron when he praises the success of the car industry – it is Unite representatives, Unite officers who have helped make it so. We have fought and won for our members where a fight was unavoidable – at London Buses for fair treatment, at Crossrail against victimisation, at Visteon for pension fairness and many others. We have recruited more than 141,000 new members as a result of our 100 per cent organising campaign, building a stronger Unite organisation in thousands of workplaces. Our Organising Department – the envy of the movement. Our political strategy has started to bear fruit, with more trade union-backed candidates being adopted to stand for Labour than for a generation. We have won new recognition agreements – none sweeter than the one extending Unite organisation to the mixed fleet cabin crew at British Airways, the issue at the heart of that bitter dispute four years ago. We have launched a range of new services to members, including a Unite Credit Union to help keep members out of the clutches of the loan sharks. Unite community centres are springing up across the country, from Tower Hamlets to Bristol, from Belfast to Durham, as part of our community membership initiative, admired across the movement. We have continued to build our relationship with the USW and to place Workers Uniting on a firm footing as a real force for workers’ rights in the world and our international work goes from strength to strength. CLASS, the think-tank we helped launch has extended its influence and helped rebalance the debate within the movement. We’re taking Unite into schools, introducing the next generation to the principles of trade unionism. We are a union with a spring in its step once more; united and purposeful. And let me take this opportunity to thank here today all of you, all of the lay activists, and all our officers, staff and organisers who have made it happen. You make me proud to be General Secretary. It’s no exaggeration to say that the future of our society and the future of the labour movement, will be in the balance over the next twelve months. If the last four years have been hard, how would five more years of a conservative majority government feel? Trade unionism has been the source of so much we take pride in from the past – from democracy and decent living standards- to race and gender equality. If Britain and Ireland today can count themselves as civilised countries, it’s the struggle of working people that we have to thank for that. “The crisis we inherit when we come to power must be the occasion for fundamental change – and not the excuse for postponing it”. And seize that future for our children. Posted in: Civil Liberties, Economy, Health, Labour, Macroeconomics, Politics, Trade Unions, UKIP. Chris Lovett: PASOK certainly were the Greek version of Labour. In 1981, they were elected to government on what looked remarkably like a Bennite programme (including withdrawal from the EU and NATO). It then moved rightwards and were only in the very recent past overtaken by the newly formed Syriza. “Why do WE have no left party?” A complex question. You say we used to but I’m not sure which you mean. Either you mean Labour (which is half true but if that’s what you meant then you should certainly accept the comparison with PASOK) or you mean a party to the Left of Labour in which case you’re not talking about a party that might conceivably win an election which Syriza now could but no similar party in the UK could because we have first past the post voting. So after all the bluster about warning Labour that if it did not offer a more radical alternative then his union may withdraw support, Len urges the union movement to shut up and unite around the Labour leadership. Just like nearly every other hack union leader in British history. Mike, plus one. Jon, We did have a left party – but that was back when I was born… 1945. First past the post didn’t alter that. The thing that makes me sick is that after 34 years of continuous Tory (I include “new” Labour) government Ed & Co. don’t seem to understand the national desire to re-nationalise Rail, Mail and the energy companies. Even Tories want it. Labour has always tried to be working class the problem was when labour came to power we had to go on strike to get decent wages. I had more strikes when labour were in power then ever with the Tories. The Tories would give in and state yes OK you can have it while Harold Wilson would say go for it lets see who wins. Under Thatcher the miners went on strike to save the mines but they would have gone on strike if it was labour, because the mines and mining had come to an end. today we have a labour party which is more Tory and openly Tory, Miliband would not know what to do if he had to go to a working class family he’d more then likely take a chaperone along in case he got attacked or offered tea or coffee in a mug. Labour is dead and sadly according to many so are the Unions. The miners strike started following the start of the McGregor plan to close most of the industry (denied by the Thatcher government at the time of course, but proved with the recent release of documents now). The NUM had national conference policy to oppose closures of pits that were still productive (as these were), and to support local areas that went out on strike. In other words it was initially a legitimate trade dispute rather than a political one, and in that sense the party in government was not relevant – although of course it was as the destruction of the industry (and more importantly for Thatcher the NUM) was behind everything, and was the next target following the success in privatising steel and docks (and taking on and defeating the relevant unions there too). What does this actually mean? Now is not the time for “heated” arguments. So what about just arguments? Is he actually saying that discussion of the Tory-lite elements of Labour Policy? And besides this is a particularly bizarre thing to say when Labour’s National Policy Forum is yet to meet to discuss the draft documents that will take the Party into the election in 2015. I sometimes wonder how much thought Len McCluskey puts into speeches like this. The rhetoric tends to leave reality behind. Labour won three seats in Kent on 22nd, 1 in Maidstone and 1 in Tunbridge Wells, and I in Gravesend. The first two will not be on Roberts list, in fact his Tories came 4th of 5 last were the Lib dems. Why! they are in Government and people even in Ann Widdecombe’s old seat have had enough of them. That old chestnut in 2015 the party which offers the best offer to the middle class will win. This is a figment of McCluskey’s imagination. Even Cruddas, who supported David Miliband in the leadership contest, is complaining about the ‘dead hand’ of Labour’s leadership smoothering hope for the future. I was at a demonstration about 18 months ago, McCluskey was on the platform talking about a general strike against austerity. It won a cheer from the audience, that, of course, was his cynical purpose: crowd-pleasing nonsense. It would be better if McCluskey offered a considered analysis instead of supporting the pro-austerity Progress/Labour Party. But then he’s got a peerage to look forward to. And by the way, I voted for McCluskey for Unite leader. Well I voted for Miliband as a GMB member we all make mistakes. What a. task the unions have to support the ordinary working man a nd woman. It is really becoming frightening. Labou.r must show their hand and come out supportin g all those that are being stigmastised and abused by this present government. Please stop following ids agenda, it is totally cruel. Our youngsters must be supported or they have no hope. Roll on next year when we can get the worst government since Thatcher out. No good Pauline we would be removing one Tory Party for a labour Progress party which will then look at cuts at the bottom while having a love in with the rich. The problem with labour it comes out with really stupid comments look at Ms Reeves the opposition minister for welfare stating if we get in I will hammer down on welfare, then spending three years trying to get people to forget that. You have labour attacking the Unions over Falkirk, you have a labour party like it or not with the worse leader in living history of the labour party movement. I hate the Tories with a vengeance but being disabled I also know that Thatcher gave us DLA and also gave us the biggest benefits rises in living history, while Blair decided to do the opposite. Not questioning or highlighting concerns as they happen is tantamount to a TV industry turning a blind eye to complaints that eventually see wrong doers being locked away. The myth in politics is that once power is gained it can then be altered to suit by those that were loyally silent. A nice theory which is historically exposed as fanciful thinking idealists the world over. There never is a good time to drop the pilot. You just have to do it sooner rather than later, and keep your fingers crossed. If Miliband was a Pilot the plane would now be in the river, but the issue is like always whom does one select then, Miliband was the best of a bunch of rubbish, whom do we have next Murphy. Reeves Burnham what a bunch to have to pick to run a country.